St. Lawrence Hall was built by the City of Toronto in 1850. Designed by architect William Thomas in the Italianate style, it provided an elegant meeting place for Toronto's 19th-century elite. The ground floor was designed as commercial space, the second as offices, and the third to house a 1000-seat assembly room and a smaller room (St Patrick’s Hall). The building was a major cultural venue for lectures, concerts, balls and receptions attended by the city's most notable citizens. These events included several important abolitionist meetings in the years when Canada was receiving thousands of Underground Railroad refugees from American slavery and, apparently, a large rally to celebrate Confederation in 1867. St. Lawrence Hall was restored in 1967 as a City centennial project. The Hall has a cupola with a large bell and though the Hall itself has been further restored in the last 50 years - most recently in 2015 when the smaller mini-cupolas were restored - the bell has certainly not rung since well before the 1967 restoration. 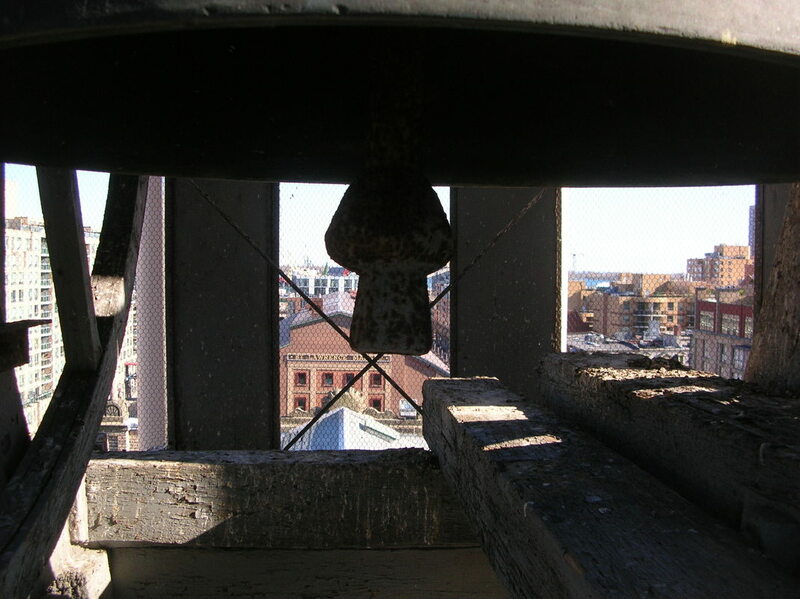 The bell is original to the Hall and was made by the famous MENEELY BELL FOUNDRY in West Troy New York. The lettering on the side of the bell reads, “FROM MENEELY’S FOUNDRY WEST TROY N.Y. 1849”. Originally the bell was connected to the clock and could be used to ring both the hours and for special occasions – it was rung to celebrate the American Emancipation Proclamation on 1 January 1863, for Canadian Confederation in 1867 and for the death of Queen Victoria in 1901. Alfred Sylvester in his 1858 book“Sketches of Toronto” notes that “The cupola forms a circular open temple of the Corinthian order, which contains a fine-toned large alarm bell, weighing 2130 pounds.” In addition to ringing the hours and being rung on special occasions it was apparently also rung to warn of alarms and maybe fires. Before the bell can be addressed, the City needs to have the cupola properly surveyed and, if necessary, ‘stabilized.” The Heritage Committee continues to press for this necessary “State of Good Repair” work to be expedited so that when the cupola is strengthened the bell can again be rung for special occasions. The St Lawrence Market Precinct Advisory Committee is very supportive of trying to move forward on stabilising the cupola and then working on getting the bell itself restored.